In the summer of 1986, three American models are shipped off to Italy to fill their portfolios with tearsheets. Thrust into a world of private parties, unlimited drugs and predatory men, these young women soon find themselves in situations that have nothing to do with photographs. Star’s dream of financial security takes an unexpected turn after a she gets into a fight with her new agent. She quickly learns it takes more than beauty to survive in a world already crowded with pretty faces. Seeking a reprieve from the demands of her privileged upbringing and Ivy League education, Joanne sneaks off to Europe without her parents consent. She meets a handsome photographer whose mere presence reveals a desperate longing in her heart she didn’t know existed. Time is not on her side, as a decision to honor family obligations or take a chance on love must be made. Casey is a naive seventeen year old who is tired of hearing her mother’s constant warnings about life. She is ready for adventure, but not prepared for the potential dangers that can be part of the journey. 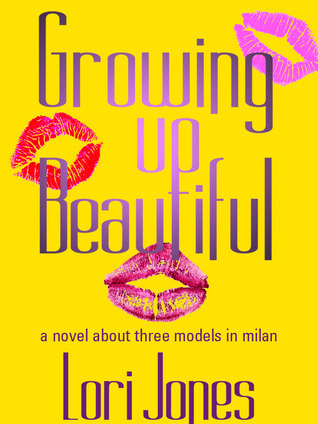 Together, these three learn the funny, unexpected and sometimes ugly truth about growing up beautiful. Growing up Beautiful was a book that I didn't have that many high hopes for and apparently for good reason. I was disappointed that it was not that enjoyable though because I can only assume that it was written based on the personal experiences of the author as I looked her up and saw she worked as a model in her younger years. Unfortunately I don't think her experiences translated well to print as it fell very flat for me. My first and extremely huge irritation with Growing up Beautiful was the use or I should probably say misuse of Italian. The book is set in Milan, and I have no problems with the use of Italian, I actually love the language and also speak it a little bit, but when the author peppers her dialogue with it and doesn't write it correctly, well then it really irks me. Simple expressions are written wrong and shouldn't verifying the accuracy of your book and the language be a priority of any credible author? There was some bad behavior and partying in the book but really, I have had wilder nights out and I am not a model. I guess there was a distinct lack of detail or believable emotion from the characters that just didn't make the story that interesting. I really hate to give a bad review to a book but with so much available out there on the modelling world these days, I just don't think this book can compete. Thank you to Lori Jones for our review copy. All opinions are our own. Thank you for taking the time to review my novel. Your are so right. Italian is a beautiful language. The 'bad Italian grammar' was actually taken directly from letters and notes written by Italians during the 1980's so I can only assume it was slang or common usage for that area at that time. Therefore, I thought it appropriate to use in the novel. All of the other Italian lines where obtained by using an English to Italian converter.